I haven't done this before on Mrs. Plant, but I want to do some educating (since I used to be an English teacher!). Today, I want to talk about reading food labels. I eat a whole foods plant-based diet MOST of the time, but there are some items I have to buy in packages. Because of this, I have to be very careful about the ingredients and the fat grams of the item. I do not eat foods that are more than 10-15% of my total calories in fat (daily). That said, I have to read labels carefully. 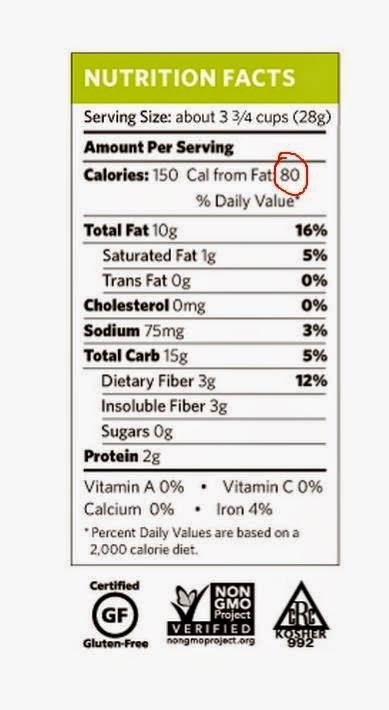 To read a label, it is essential that you divide the CALORIES FROM FAT into the TOTAL CALORIES for a serving. This will give you the percentage of fat in a serving. For example, SKINNY POP has 150 calories per serving and 80 of those calories are from fat. So, a serving of "Skinny" Pop contains 53% fat! It's definitely NOT going to make you SKINNY! Please read labels. Don't buy packaged foods that have ingredients in them that you couldn't buy in the grocery store yourself (i.e. chemical-sounding ingredients). Buy packaged foods with MINIMAL ingredients, and eat mostly whole plant foods if you want to reverse illnesses and lose weight. GO GET 'EM!